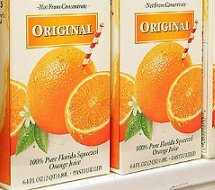 More and more of disappointing facts are found out about our favorite orange juice, which we used to consider one of the healthiest and the most useful fruit juices. Just recently the scientists warned us that drinking orange juice on a regular basis can seriously affect our dental health and damage our tooth enamel. More to that: according to the results of the latest research by the specialists from Harvard Medical School, regular intake of orange juice (even one glass a day) is inked to increased level of sugar in the blood and increased risk of having type 2 diabetes in women. About 71,000 of American nurses participated in the long-term experiments. For 18 years their eating habits were supervised and recorded. As a result, it turned out that drinking a glass of orange juice regularly (every morning) increases the risks of having type 2 diabetes in women up to 18 percent, and drinking 3 glasses a day are connected with 24 percent increase. The specialists suppose that this phenomenon should be attributed to the damaging effects of natural sugars which can be found in orange juice. In the absence of fiber the we receive when we eat fruit, natural sugars get absorbed in our digestion system very fast and cause increased sugar level in our blood. Therefore, if you like drinking a glass of juice (especially a glass of arguable quality commercial fruit juice from a supermarket) in the morning, you should think twice about possible health effects of this habit. Type 2 diabetes is one of the hardest health conditions which currently affects more that 2 million people in the Great Britain. The specialists recommend replacing drinking juice with eating fresh fruit as the fruit can provide you with the fiber necessary for slowing down sugar absorption. You can read more about the findings and comments on this interesting research in the latest issue of the journal Diabetes Care. This entry was posted 9 years, 6 months ago.